When you go out to eat, sometimes that is all you do. Coat off, drink, eat, coat on, and out. Sometimes that’s perhaps all you actually want. My never-to-be-forgotten Bohemia lunch in Jersey was one of those occasions: a leisurely four hour festival of (extremely) good things to eat and drink, in an atmosphere of enjoyable bonhomie. And, last night I found another, right here in Ventnor. My friend Debby is living 72-hour weeks right now, and at the same time having her home’s interior torn out. She was feeling a tad frazzled so, on the emailed advice of Mr Gary Bonsall from London, I suggested a gentle evening at the Hillside Hotel and Restaurant, just down the road from her home. The choice could not have been better. The Hillside is a Georgian house, chastely and classily renovated as a 23-bed hotel and dining room by Danes, Gert and Anna. They have mixed the clean, unfussy lines and style of decoration we connect with Scandinavia with the old stones in a most relaxing way. You feel comfortable the moment you arrive in the little garden in front of the dining room. We arrived at 6.20 and, on Gert’s advice, took a small bottle of Joseph Perrier champagne in the garden whilst awaiting dinner. Awaiting? Oh, yes. Dinner is at seven. Look at the menu? There is no menu. At the Hillside, you are invited, as it were, to a private home: you eat what is served. You book 24 hours in advance, the chef buys the food required (there is a choice between meat and fish), and that is your dinner. I’ve done this only twice before: once near the Marché in Nice, circa 1979, and one last year in Maastricht. Both results were splendid. So was this. The food was in no way pretentious – a little smoked chicken, avocado and pine-nut starter, a very nice piece of stuffed veal with delicately swirled potato and tiny carrots (Debby had a fine-looking grilled salmon), and a deliciously light little lemon sponge with raspberry coulis and fresh mint. I was horrified to see other diners leaving the mint! It is not what my pal, Montmorensy, calls ‘gar nichts’ and the profession ‘garnish’ (M is right! ): you pull it apart with your fingers and mix it with the lemon ... yummy! An excellent bottle of 2008 Sancerre rosé, a little Montbazillac with the pud, and a nice Calavdos on a Danish chaise longue on the verandah, to end … and the whole served by mine host with more warmth and style than I can ever remember meeting with in a restaurant. We got to the end of our 2 ½ hour evening, feeling that we had been the only people in the room (we certainly weren’t), and that everybody’s efforts … and Gert’s in particular ... had been wholly devoted to making sure that we had a wonderfully relaxed and enjoyable evening out. We did, my friend, we sure as Hell did. Oh, I suppose you want to know price. Bill for two, with all that very fine drink: 100 pounds. A couple of Ventnor parking fines. 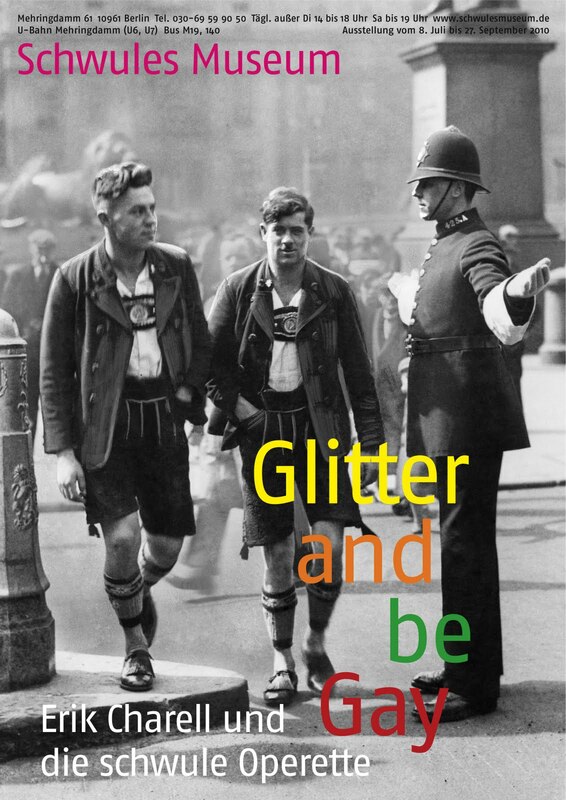 One thing I’m going to miss, however, by not being in town in July, is the opening of an exhibition organised by my Berliner buddy, Dr Kevin Clarke, at the city’s Schwule-Museum: an exhibition entitled ‘Glitter and be Gay’ and devoted to the life and work of the German director and choreographer Erik Charell. Charell, famous largely as the original stager of what the English world knows as the musical White Horse Inn and as the director of the famous film, Der Kongress tanzt, was a specialist of the spectacular stage – large revue and Operette productions with large scenery, large casts, large stars, heaps of colour, glitter and choreographic movement – the 20th century equivalent of the 19th century French and German ‘grand opéra-bouffe féerie’ productions. Material from his shows should, of course, make for a splendidly pictorial exhibition, and I shall be fascinated to see what Kevin has managed to gather from around Europe. A couple of years ago, I contributed a chapter to Kevin’s book, also entitled Glitter and be Gay, dealing in ground-breaking (and since imitated) fashion with the subject of homosexuality and Operette. So I feel personally involved in this project. Happily the Exhibition is going to be still showing when I arrive in town … but, alas, I shall miss the undoubtedly glittering and gay Opening, for which others are flying in from as far afield as New York ..
25 June 2010. 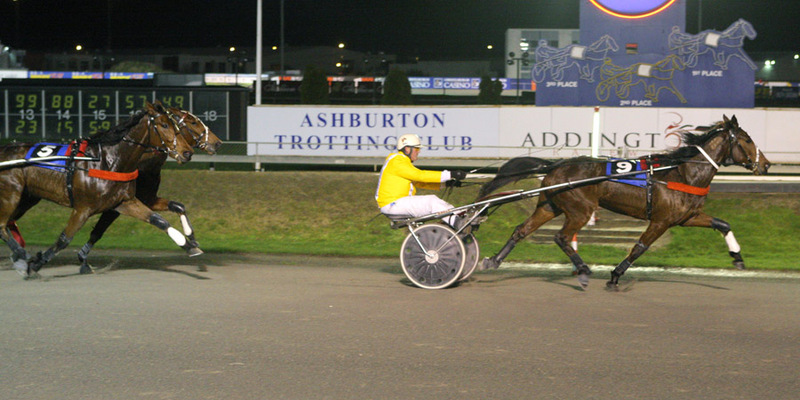 A landmark in my ‘career’ in the world of harness racing. Yes, I’ve been distracted by restaurants and trips and parties and people these last few weeks, and the blog has wandered away from the racetrack, but, all the time my babes have been building up their careers … up towards… well, as it eventuates, towards 25 June. If my French adventure seems to have fizzled out – Rosy retired with respiratory probems and Tenor, after his win, crumbling into something similar -- both the New Zealand and the Australian ends of the Gänzl und Gerolsteiner Empire have – while I’m over here, of course -- been warming up nicely. 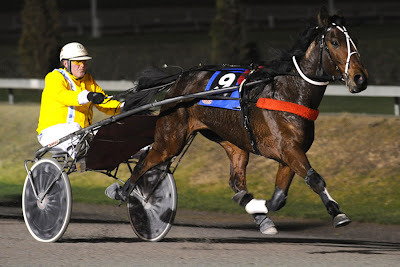 In Melbourne, little 2yo Livia brought her record to 4 starts: 1 3rd and 3 4ths, before, this weekend, tackling the big girls in the VicBred Superseries. Alas, a lousy draw left her stranded out, she was last on the turn, and though she made ground coming home, 7th of 10 was her lot. She will, I know, do better ... and she’s due for a decent draw soon! Over in New Zealand, as Elena prepares to come back to racing, little Seppl made his debut. Looking likely to run in the money at his very first start, he had a wee frightened gallop short of the post, but next up he very nearly took the bacon, being just pipped in the finale, after leading all the way, for a promising third. His little buddy Fritzl, after a couple of nice placings a month or two back, has been having ‘time out for growing’, but yesterday he was back, ready to start again, in Race One in Ashburton. And one of his rivals there was … Seppl! The two ‘little boys’ of Gerolstein – the first foals I ever bred there -- taking their togetherness to extremes as rivals for a night. Seppl had attracted the odd eye with his two dashing runs to date, and to my horror he was top pick in the press, but a brilliantly-bred filly (out of former star trotter Merinai) was rumoured to be a starlet in the making and she duly went out warm favourite. My two little fellers were fifth and sixth choices in the field of sixteen. Fritzl began well, and was quickly up behind the leader. Seppl began – as his mother used to – superbly and, from his wide draw, zoomed across the track to go smoothly past everyone and take the front after 200 metres. And there he stayed, trotting beautifully, and looking such a dapper little hero, until, on the last lap, the favourite loomed up outside his cart. But, round the last bend, Seppl was still going strong and the favourite wasn’t coming at him. Out wide the second favourite was running on from too far back, but my little boy was cruising … and he ran to the line, seemingly untested, to win by more than two lengths. And behind him, powering past the favourite, from a three-deep spot on the fence, came Fritzl! Gerolstein one-and-two! My first ever quinella! And, even better, the first victory by a horse bred and born from the ‘Gerolstein family’. Truly, a landmark in my racing career! 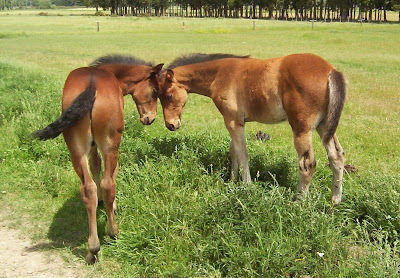 Uncle Seppl and Nephew Fritzl ... the little boys, no longer little but grown up racehorses. 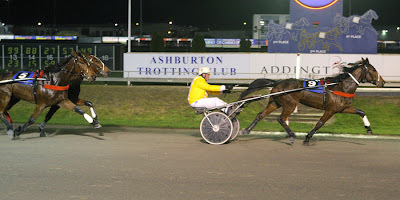 Ajay from Race Images sent me these pictures – Seppl steaming solo down the straight, and the finish .. see how clearly he won, and yes, number 5 is Fritzl. But there’s another one of Seppl back in the birdcage which I must get. He’s standing up like a straight and sage little angel, steam swelling from his body, but its his eye .. so bright, so perky .. you almost believe he was smiling. Well, I was! I listened to the race in the wee small hours, here on the other side of the world, and there was no going back to sleep after afterwards. As my email and facebook lurched into life, congratulations flowing from even folk I hadn’t seen in years, I got ready for an exceptional day. And it was. Somehow it was the day that even folk who don’t follow racing chose to get in contact, there were reviews and articles to write, plays to read, and come 5pm, off I rolled with my friend Debby to a vernissage at Sandown’s ‘Boojum and Snark’. A dozen local artists had each contributed a work inspired by Lewis Carroll’s ‘The Hunting of the Snark’ which, did you know? was written in Sandown. I didn’t know, and in fact I have never read the poem. But there was a copy there, so I dipped in. The works: a couple of ‘sculptures’ great fun, several pictures interesting, the usual percentage not. But a grand idea, and an appealing enterprise. Well, not quite the end! My computer, left to its own devices, had, in the four and a half hours of my absence, accumulated another vast volley of horsey hurrahs and other delectable missives … I don’t know what time I fell into bed. But I’m sure that I dreamed not of Snarks nor even of cheese soufflé, but of my little boys. Seppl and Fritzl. Fritzl and Seppl. God bless ‘em. Time enough to feel for Gerolstein when I get home and see how many thousands of dollars worth of damage the weather has caused (thought: I wonder if that’s covered by insurance .. you know, act of God. Jupiter Pluvius in this case). So where am I supposed to lunch? But I don’t give up, and sometimes I score a hit. The Buddle Inn, down the hill here at Niton, is a very attractive example of the Wightish megapub. It has a nice feeling of realness about it, in spite of the beams and brasses, and it has a splendid terrace where one can sit with one’s script or Macbook and indulge in one’s ginger-beer shandy in relative quiet. And their crab sandwich was much less of a doorstep than usual. Buddle is nice. Will return. Everyone is doing their very best to help me find suitable places. They know how keen I am on nice lunching. So when I was told that the Boathouse at Seaview was under the same management as my preferred New Inn, Shalfleet, I decided – especially since I had so far missed Seaview -- to give it a go. Well, Seaview and its uncomfortable (for Fred) streets, and view of the mainland, I can take or leave. And the Boathouse (what a silly name for something that evidently isn’t) is not the New Inn. So I did crab sandwich (not Buddleworthy) and shandy (not Fentiman’s) and sat in the sun (nice) by the theoretical sea (view obscured by a stone wall) and read my script (excellent), and thought I’d come quite a way for very little. Won’t return. Yesterday I didn’t lunch. I went searching. Down to Steephill Cove where there is a restaurant named (believe it!) the Boathouse, which, I had been told, you had to book hours or weeks in advance to get into. This is, of course, no guarantee of quality, but I like Steephill and thought I would look. I looked, and I liked the look …. but the place was closed. Wednesday is ‘pause’. But the pretty lass in the next-door ice-cream shop (recommended) mobile-phoned the owner and half an hour later he turned up. Since he was even prettier than she, since I had enjoyed my time in the sun (with cider sorbet), and since he was able to fit me in for today, I forgave him. In fact, I thought I might get him, on the morrow, to teach me how to eat the lobster which is the chief item on their menu. Because, confession time!, I have never, in all my years, dared order lobster – not even in all those cruises through the Pacific – because I don’t (didn’t) know how to get into the shell! The Boathouse is a ‘yes’. Their fresh sea-food is a big, big ‘yes’. Their venue, metres from the waters of the bay, and wonderfully unpretentious, is a vast ‘yes’. The young ladies who serve you (dammit, the boss wasn’t there) were deliciously not quite professional and a definite ‘yes’. And they gave me my lobster lesson. Because I ordered lobster, and I ordered crab, and I ordered prawns and they were all wholly, enthusiastically ‘yes’. Any ‘no’? Yes. They are so unpretentious at the Boathouse that my wonderful seafood came on a huge bed of (argggh!) common shredded lettuce, accompanied by common shredded carrot and what looked severely like very common ex-frozen corn. I ignored all that .. left it on the plate .. and just ate the delicacies. Wonderful! My lunch gained an extra bit of pleasure from the fact that the two tables next me were occupied by the most delightful mainlanders .. ‘we’ve been waiting to come here (the restaurant) for a year’ .. to whom, after my second bottle of local Goddard’s Ale, I believe I recounted half my life history. Well, when you meet nice people, that’s what you do. I do. I have had – lettuce or not –a grand day. And I’m booked in again for next week, when I’m going to have company of my own. My dearly beloved brother John is coming down from Leicestershire for a few days .. so the Boathouse .. the REAL one .. is a must! And we shall have champagne instead of Ale and .. chuckle .. HE can drive home! And he got his electric guitar! Yes, these last three days, I’ve been out and round and about. From Newport, we drove out to Cowes: a first for me, as the traffic and parking situations there had always made me stop short, at Osborne House. It seems like a busy place, full of the little and not so little yachts that have made its fame. My adventure of the day was to cross the Medina River by the chain ferry – a barge which chunters across a few watery metres -- rather like the one I went on recently in Dresden! Friday, I set out on another mission. I decided that I had to go back to Bembridge and revisit my favourite Wightisth restaurant from last year: just to make sure my memory wasn’t playing me tricks. So, Fred and I sped up across Brading Downs, and back into the narrow street of the seaside village of Bembridge. First of all, I popped in for coffee with my friend, Tiffany, at her delicious B&B (‘Breakfast at Tiffanys’, of course, where I stayed last year), and then on to Fox’s. It’s still the same. It still looks a bit like a caff from the outside, Nicola is still there serving cheerfully and husband John in the kitchen. I took a table in the sun, on the neat green lawn out the back, and ordered my lunch. Now, Fox’s is one of those restaurants that have a small menu. Perfect! You know everything is going to be fresh, not unfreeze-microwaved. But it also means you mustn’t have too many dislikes ... and you know me: no chips, no lettuce, no broccoli. Today the soup of the day was broccoli and pea. However, remembering John’s wondrous sea food soup from last year, I determined to try. Well, it’s the best broccoli soup I’ve ever had, but I’m still not keen on broccoli and, you know, since Bohemia, I’ve got new ideas about peas too. To follow I had a delicious, if slightly unplump lightly pan-fried plaice with spuds and veg. It was obviously not a plump plaice day: I checked out the grand wet-fish shop next door afterwards, and the day’s catch were all pretty Twiggyish. But never mind! Small is good. Small and nicely cooked is good. Small and nicely cooked and fresh is excellent. And one can always rely on that at Fox’s. Fresh and nicely cooked. But next time, before I drive across the island, I’ll check that the sea-food soup is ‘on’ and broccoli is ‘off’! Oh. I should add that the two-course lunch was ... seven pounds and 75p. Value for money, did I hear you say? You bet. Saturday was an early start. For Saturday was the Round the Island Boat Race, and the enterprising Winter Gardens complex (remember my big piece on its dubious and fading charms last year?) were doing champagne breakfast on the balcony which overlooks Ventnor Bay. So Debby and I made a brunch date, and Fred and I duly scaled the cliffs down to the Esplanade. More than seventeen hundred little and large yachts filed past (even at 8.30am we were too late for the biggest boys who, the French at their head, had already passed the winning post) in a shattering of white sails. Normally, it is a multi-coloured sight, but today the wind was coming from an awkward northerly quarter and all the colourful spinnakers were, thus, stowed away until the other side of the island was reached! An extremely pleasant morning with old friends and new passed by in the wriggle of an hourglass .. and then, after a quick visit to Goodman’s very interesting delicatessan to construct myself a Sunday picnic (fennel sausage! dear old Cantal cheese – in my French days our ‘cheapie’ now 20 pounds a kilo! -- and .. oh look there’s a bottle of Châteauneuf du Pape! ), Fred and I waddled back up the steep slopes to our eyrie on St Catherine’s Downs..
A gentle evening, I feel, is in order, given champagne for brunch and the Big Birthday tomorrow. After my exquisite experience at the Michelin-one-starred restaurant, Bohemia, in St Helier (see under Jersey), I thought – as I travel on – that I would attempt more of the same. So, this week, being in the Isle of Wight, I hied me off to the Michelin-one-starred Hambrough Hotel, Ventnor, for dinner. Something is wrong. If Bohemia is worth one star, the Hambrough is a ‘minus two or three’. If the Hambrough is correctly valued at one star, then Bohemia is worth three or four. There is no comparison between the two in any way. And since my Hambrough meal for two (one bottle of wine), at 189 pounds, cost me more than my four-hour Bohemian festival, with flowing champagne … well, as I say, something is very definitely wrong. Specifics? My starter was John Dory with a crab ravioli. It looked nice, but the fish was overcooked. The ravioli was fat and fine ... the best thing I would eat all night. My main course was pork with boudin and apple. The pork was fatty yet dry, not tender, the boudin no better than what I’d eaten for my B&B breakfast and the apple a horrid wrinkly thing (with skin) which brought back bad memories of childhood. I left most of it, took disappointed refuge in the cheeseboard, and my night was saved from utter disaster by a double portion of époisse. It is still (at the princely price of 7 euros a piece) the best cheese in the world. The white burgundy was on a par with Bohemia’s but, at 40 pounds the bottle, so it should have been. The two inches of pleasant port, at 26 pounds, I resent. My companion for the evening, who knows her way around this town as few others do, has promised me that Ventnor can do better. I know the island can: last year I had several splendid meals at Fox’s in Bembridge. It may look like a caff, but the food is first-class, and you can dine royally for 30 quid.. So, Monsieur Michelin …? You led me into a few traps in the old days (a horrid meal at the Cagnard in Cagnes-sur-mer in the ‘80s is still vivid), but Bohemia memorably restored my faith in you. It is now severely shaken. It is a fortnight since I arrived in Wight, and you will notice that the bloggings have not been flowing as freely as in previous years. The reason? I have come here for a rest of sorts. A quiet life – after the colourful days of Berlin and Jersey -- with simple strolls and drives, when the weather permits, a few social outings only, and a lot of time lounging peacefully in my delightful suite, working unperturbably away at my multi-volumed Encyclopaedia of Victorian Vocalists. But, of course, that isn’t to say that I haven’t been out and about a bit. With Bohemia blossoming in my memory, I ventured forth in the company of my friend Debby to try the local one-Michelin-star restaurant, the Hambrough Hotel. My reaction has a page to itself (above). The next night, Debby and I went out for a much more enjoyable evening: the vernissage of an exhibition of photos of the famous 1970s Isle of Wight pop festival taken by veteran snapper, Charles Everest. The exhibition was being staged at Dimbola, Freshwater, once the home of famed Victorian photographer Julia Margaret Cameron, and, alongside the room of Everest’s memorable coloured photos of The Event (even operatic I recognised Baez, Joni Mitchell and Miles Davis, amongst the too-many microphone swallowers, although I have no idea who the naked frolickers in the sea were), were a whole series of splendid exhibitions, ranging from the permanent collection of the lady’s own work, to some magnificent ancient and modern pictures by a local father and son. Father’s self-portrait was particularly splendid. We sipped white cask wine, nibbled a first-class buffet, chatted photography (I was ashamed of my little Fugi digital .. everyone was sporting lenses half a metre long, and vast flash pans! ) et al, and enjoyed the pictures and the people until dusk threatened and it was time to go home. Actually, the next day that the sun came out, I went back. It’s sometimes a little hard to see things properly at a vernissage packed with people .. also, I decided I owed them at least a cuppa in their café in return for their hospitality. So I set out via Brightstone and .. Hulverstone! The nice-looking pub my pal Jasper had recommended to me. So I pulled up. It is a pretty spot, a nice old pub a bit awkwardly arranged inside and now unpicturesquely added to, but with a grand green lawn and tables from where one can look out to the sea. The ginger beer shandy, served to me by a suicidal-looking and overworked barman, was fair (cheap ginger beer just isn’t an option) but I shrunk from the sandwich idea when I saw one go past. This, like Brightstone, must be a ‘family pub’. Door-stop slices of bread, drenchings of lettuce and I’m sure I saw potato crisps. In recent decades, record producers have spread their hands widely, turning out recordings of many operatic works unfamiliar to today’s stage. But one area of operatic music has been largely ignored: that of the enormously successful English language operas of the 19th century. Those of us who are interested in this rich period of musical theatre have been forced to rely largely –when they can be found -- on bootleg, amateur or radio selections of such once standard pieces as The Mountain Sylph, The Bohemian Girl, Maritana, The Rose of Castille, Satanella, The Lily of Killarney, Robin Hood and Lurline. But now, at last, that seems set to change. 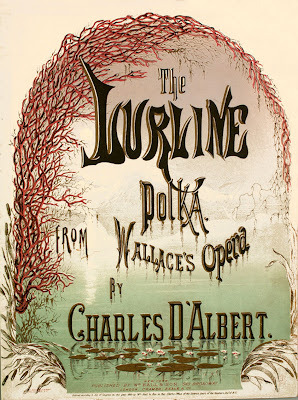 Two years ago, Raymond Walker’s Victorian opera brought out a recording of Balfe’s The Maid of Artois – far from being a core work of the Victorian repertoire – and the interest which it evoked has resulted in a second like recording, this time of one of the more widely popular English operas of the second half of the 19th century: Vincent Wallace’s Lurline. It is said that Wallace wrote this work many years before its production in 1860 by the Pyne and Harrison Opera, at that stage Britain’s most important and lavish English opera company, and that he was influenced in its writing by such successful German supernatural operas of the era as Der Freischütz and Der Vampyr. But he had no need to go to Germany for his subject: the operatic Lurline, or the Revolt of the Naiades (music: H Louel et al) had been a hit at the Adelphi Theatre in 1834, many balletic versions of the tale of the Nymph of the Rhine had since been seen on British stages, and Christmas 1859 saw the Adelphi repeat with the burlesque The Nymph of the Lurleyburg. 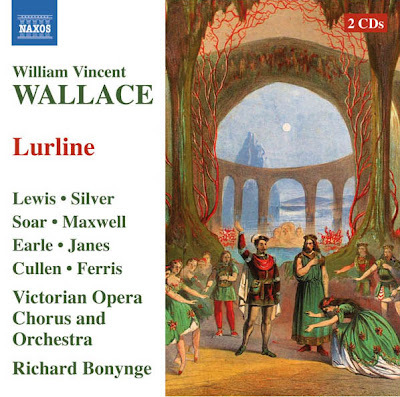 Musically, too, Wallace’s tones remained ineffably English – in listening to the score of Lurline one catches regularly the styles which Arthur Sullivan would later gently parody. However, although – in spite of contemporary critics’ calls for the abolition of ‘Italian’ recitatives in English operas – Wallace here chose to go that way. The result was a piece with some expository musical longueurs. The solos and ensembles of Lurline, however, included some very pleasing pieces – from the soprano ’Flow on, oh, silver Rhine’ with its obligatory (for the period) coloratura, to the jaunty contralto ‘Troubadour Enchanting’ and the ‘Henry Phillips style’ bass ballad ‘A father’s love’ and some richly written finales. None of the songs would become ‘take-away’ standards in the manner of the top numbers from Pyne and Harrison’s most recent successes: Satanella’s ‘The Power of Love’, or The Rose of Castille’s ‘The Convent Cell’ and ‘I’m not the Queen’, but in the show they were undoubtedly effective. The new opera, with its familiar tale, its spectacular and picturesque staging, and a top cast, headed by Louisa Pyne, William Harrison and Charles Santley, the best operatic soprano, tenor and baritone of the time and place -- turned out a decided success and, following its initial seasons at Covent Garden, it was played four more seasons by the company, before going on to become for decades (in a sometimes heavily slimmed down version, with virtually all of the recitative banished) a regular item in the repertoires of touring opera companies in Britain and the colonies. In the process, it made itself a deserved place amongst that double-handful of standard British operas of the 19th century. Lurline, seemingly in its complete original form, has been put together and recorded at a very noticeably higher level than was The Maid of Artois. Orchestral and choral forces, under the baton of Richard Bonynge (also concerned in the preparation of the score), do an impeccable job with Wallace’s occasionally rather square choral and orchestral lines, and burst and surge forth splendidly when the composer does, in his finales, ensembles and interludes. The two principal soloists both give a magnificent ‘Pyne and Harrison’ performance. Sally Silver sings Lurline with beautiful tone and limpid clarity, invests her melancholy and unshowy Grand scena with warmth and feeling, makes a gem of the showpiece ‘Flow on, oh, silver Rhine’, powers out the ‘Night winds’ as if it were ‘Tacea la notte’, and tosses off the coloratura bits of the show’s finale with unperturbed abandon. The sweet and pure tenor of Keith Lewis shines through in Rudolf’s 1st-act barcarolle and his pair of sentimental ballads, but really catches fire when Wallace pairs him with Lurline and lets him soar with masculine passion instead of play with pretty pensiveness. Fiona James make a nicely purple-coloured if not very contralto ‘other woman’ as Ghiva, David Soar an efficient though sometimes not-very-baritone Rhineberg, singing his opening aria with great vigour but stretched latterly at the top, and the two not-very-buffos (Donald Maxwell and Roderick Earle) fill their roles capably. In each case it might have been preferable to follow the original contralto-baritone-buffo-strong buffo manner of vocal casting. But this is a minor quibble. Naxos and Victorian Opera’s recording is as welcome as flowers that bloom in the spring. It is welcome as an historical document, letting us, in the 21st century, hear in its fullness and thoroughly professionally performed, a work – one of a group of works – which should never have been allowed to sink in obscurity. It is also welcome as a very agreeable ‘listen’. Lurline has its faults .. that it was curtailed for popular consumption is not surprising, and 21st century listeners may have an unfortunate giggle at musical lines such as ‘Rupert alive? we thought you’d drowned’ and some of the chorus cadences (boom-BOOM) ... but immerse yourself in, for example, this opera’s second act finale and, if you didn’t know before, you will understand why Lurline was one of the favourite operas of its age. Roll on Victorian Opera’s forthcoming Robin Hood (Macfarren) and all that shall follow. We were three foot-passengers only on that ferry, and thus I passed a jolly, long, John-Smith-bitter evening with Scott, a 21 year-old bodybuilder and naval engineering student from Southampton University, and Simon, a 24-year-old physics PhD-er from Bristol Uni, with a passion for peluche animals … a suitably surreal situation for my transition from Jerseyman to Wighter. And now, here I am, curled up in my lovely, peaceful and sunny white suite, in the Best B&B in the World: Hermitage Court Farm, St Catherine’s Down … see the blog for 2008 and 2009 and doubtless eventually more years in the future, for details and endless pix, of which -- why not – just one more! I am earlier this year, and the paths are mown and clean, the rhodies and the hawthorn are out, the daisies, buttercups and millions of bluebells throng the greensward ... (sorry, I’m working on nineteenth century documents and the language is catching) … even the flowering gorse looks pretty. And the downs, so green with their flowing view down to the Solent..
My fourth day, however, dawned so summer-perfect that it was clearly time to get out and about. South Wight Rentals, bless ‘em, had saved me my ‘Red Fred’ of the two previous years (see in above picture). He is a little battered now, but I love him lots. He is one of two cars on this earth who does exactly what I tell him! And this morning it was time for the two of us to venture forth. Where to? I’m afraid I am predictable: each year my first trip is the same. Via Brightstone. Mottistone Moor and those little ‘deep-breath-in-Fred!’ country roads where two vehicles can’t really pass, to Newtown, with its fabled little Town Hall, its pretty houses and church, and its delightful Estuary walks. I did ‘em all, for the umpteenth time ... and they were lovelier than ever. I visited the National Trust bird-hide and saw the plaque to the memory of the mother of my friend Jasper, I took a new version of an old walk across the tidal waters with their throng of little white boats … and, when all was done, Fred and I tootled down the road to Shalfleet and its well-known New Inn for a ginger-beer shandy and black sausage and cheddar salad. When you are a critic, you write your review – whether it be of an opera, a musical, a concert, or a restaurant -- and you wonder very often whether what you have written is of the slightest significance, the slightest use. Well, I like to think that my thrilled but sane opinions, on that quarter-of-a-century-ago first night of Les Misérables, had a little influence on the way the show was boldly and successfully reshaped after an indifferently well-received opening night. ‘Cut the little boy’ was one of my declarations to a shocked co-director. They did, and the improvement was manifest. It probably wasn’t because of me, but I like to think it was. Today it happened again. My reviews of the New Inn have always been good, but last year I had one horrid stricture. Their otherwise delicious sausage salad was made with … shudder … lettuce! I penned my disapproval loudly. And today, when my shandy (the best, made with excellent organic ginger beer) and salad arrived .. no lettuce! Lovely, tasty green-leaves instead. My best meal ever at the New Inn. Well, they may or may not have read my notice, but I prefer to think that they did ... and just as with the musical, the meal has profited enormously! I cruised home, most satisfied, down my favourite roads to the ever-rising Chale Green Store, where I picked up a couple of bottles of nice if pricey Chablis and some wild hare pâté ... they will do very nicely for cocktail hour on the sunny lawn with Jayne and Chris in .. goodness, a couple of hours time..
Oh, it’s good to be back in Wight ... in full colour!